While the world cup of many sports and the Olympic and Commonwealth Games come around every four years, and an election in New Zealand once every three, a General Chapter in the Society of Mary comes only once every eight years. Put simply a chapter is a meeting of members of a religious order to review the past and prepare for the future. A General Chapter is a general assembly from members from all over the world of an order or congregation. The Franciscans called it a Chapter of Mats, we generally use seats! Marists have local (New Zealand) chapters once every four years too. So in September and October this year, Marists from all over the world will meet in Rome to have the once-in-eight-years assembly. Around about the same time, September this year, the next General Chapter of the Marist Brothers will be celebrated in Rionegro (Colombia), approximately 40 km from Medellín. People often confuse the Society of Mary (SM) (sometimes known as the Marist Fathers and Brothers) with the larger and better known Marist Brothers of the Schools (FMS). Both orders (actually the correct word is congregations) are present in New Zealand and around the Pacific. No, not everyone goes to the chapter. Usually there are elections in each country to determine who will go. The number of participants from each country is determined by the number of Marists in that country or province. So New Zealand will send four to the General Chapter this year. 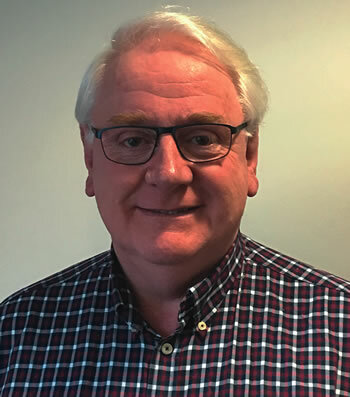 It’s quite a complex formula – but basically, as well as the boss (the Provincial), in New Zealand, we get to elect one delegate for every 50 or part thereof – so since there are about 115 Marists in New Zealand we get three to join the Provincial. The New Zealand representatives are Fr David Kennerley, the Provincial, and Frs Justin Taylor, Mervyn Duffy and Timothy Duckworth. Where is the Chapter held? Our General Chapter is to be held in Rome at a place outside the city itself – in a town called Nemi. Nemi is in the Alban Hills of Rome about 30 km Southeast of the city. The pope has a bach nearby in a place called Castelgandolfo – his summer residence. The beauty of this part of Rome is that, being slightly elevated, it is cooler than Rome, which really swelters in the summer heat. 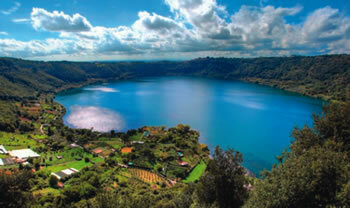 Castelgandolfo overlooks Lake Albano, and Nemi overlooks Lake Nemi. Both are crater lakes in old volcanoes. Like Rotorua, the area is noted for a gentle whiff of sulphurous gases. 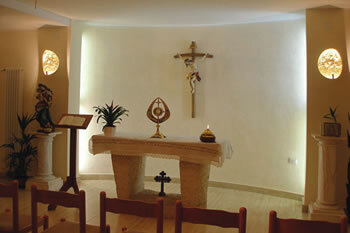 At Nemi, the Divine Word Missionaries (SVD) have a large conference and retreat centre with one hundred guest rooms. The General Chapter decides on directions for the future, it also elects the superior general and his council. When it is in session, the chapter is the highest authority in the Society, but it does not have executive powers. What happens at a Chapter? To prepare for the General Chapter, the Superior General writes a report on the 'state of the nation' at the end of his 8 years as SG. The General Bursar writes a financial report and each provincial or regional leader also writes a brief report on his unit. In the past, one of the biggest challenges facing a gathering of Marists was that we spoke a variety of different languages. Most had English but a large number were Francophone, and in more recent years, Spanish and Portugese speakers have had to be accommodated. Simultaneous translations were often done with specialists, both Marists and others, helping to do that. That also meant that all documents for discussion had to be translated into these other languages for easy reference. Today, nearly all Marists are fluent English speakers and, with a little bit of assistance, most are able to follow the process. Liturgies in many different languages are good ways to develop one’s facility with other languages too. I’ve seen days in which the principal celebrant spoke French, the first reading was in German and the psalm was in Samoan, the Gospel in English and hymns were in Italian, Spanish and Tongan. Some people are 'meeting people,' and thrive at General Chapters and others, I imagine, find them quite difficult. The day starts quite early and finishes quite late. Kiwis find that anything past about 5 pm feels like overtime, but it is nothing for Europeans and others to work all day and half the evening too, with dinner coming quite late in the day. Having said that, Europeans have to have what we generally refer to as a siesta, which is the Spanish word for what the Romans call a riposa. During that time it is tempting to fall asleep for half the afternoon, but the experts suggest just a 30 minute powernap and maybe a gentle walk to clear the head. The future of the Society of Mary is in the hands of the Chapter Delegates and if you have time for a spare prayer for us and for the Society we would be very grateful. With all good wishes for a successful Chapter from the Marist Way in England! From good old Germany offering best wishes and praying for your General Chapter. Thanks a lot for all the interesting bulletins and photos. Belated congratulations to Fr. Larry Duffy for his 50 years of profession and God's blessing for your new Superior General to be elected on saturday. Many thanks for your kind thoughts. Great to see that the Marist Messenger is being read in Germany. Thanks to you for your kind answer. And as for today's Chapter News, I was very pleased to see you with Pope Francis, as well as for his appreciative and encouraging words to you. - Besides, what a nice opportunity to congratulate him on his Saint's day.